Flowers have been done and done and done in photography, from Cunningham to Mapplethorpe, and done well, so it's a challenge to try and see them in a new way. I'm a rabid (beyond avid) gardener, and I have plenty of subjects to choose from once the yard wakes up from winter, but I've always had an affinity to poppies: their flowers are here then gone, crepe paper that leads to pods full of hundreds of tiny seeds (the ones gracing your scone come from the infamous opium poppy, though they have but a trace of the alkaloids that made that poppy notorious). The Shirley poppies are a sport of Papaver rhoeas, the common field poppy, that was collected by a vicar in England. He gathered the seed, planted it, and continued to collect it as the variations became more bizarre and outrageous. 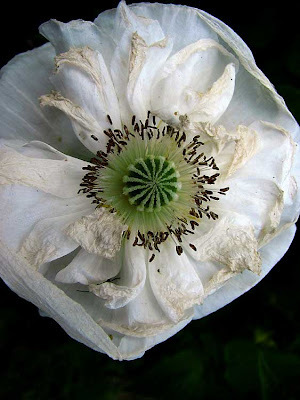 Now, there are untold oddball Shirley poppies out there in all different colors and with unusual patterns. A single packet of seeds provides more unusual flowers than you can imagine. And the flowers last but two days. I spent a fair amount of time last summer shooting Shirley poppies, and it's hard to believe they spring from the same plant sometimes. This is one of the better images, I think. This year, I'm sure I'll be out in garden again, manuevering my tripod and exposing for maximum detail. *Note: I've yet to set prices, but images denoted with an asterisk will be available for purchase, probably as unmounted inkjet prints.